Warm front play in southern Oklahoma. Intercepted warned storm near Snyder, OK noting fuzzy partially elevated base. Abandoned it near Lawton for new storms coming out of Texas, but cap killed developing storms. Another chance at tornadoes in Oklahoma, this time with a warm front play just north of the Red River. My initial target was the Frederick area where storms would come off a dryline bulge and track up toward Lawton or Chickasha. This was my sixth night in the van, having camped on a little dirt road north of Vernon, TX. It was a nice, quiet spot but the mosquitos were pretty bad. Storms went up early, too early, before the airmass was primed and right on the frontal boundary. 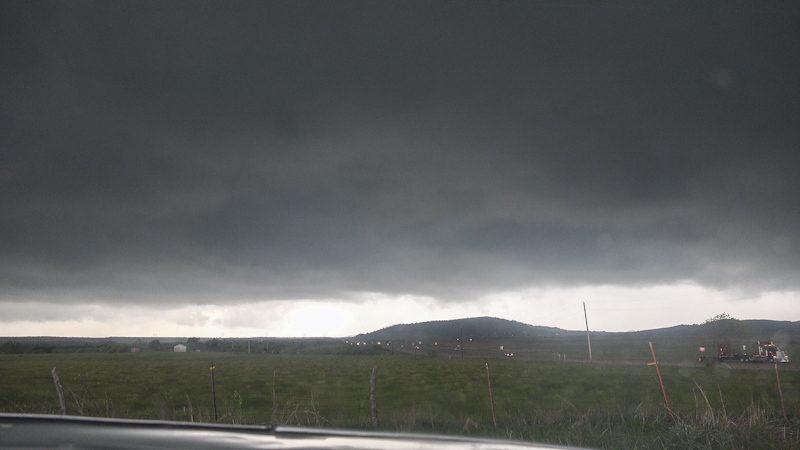 I caught up with a tornado warned storm west of Snyder, but terrain initially blocked my view. A fuzzy grey base near Snyder meant the storm was probably partially elevated or didn't have the thermodynamics yet for tornadoes. 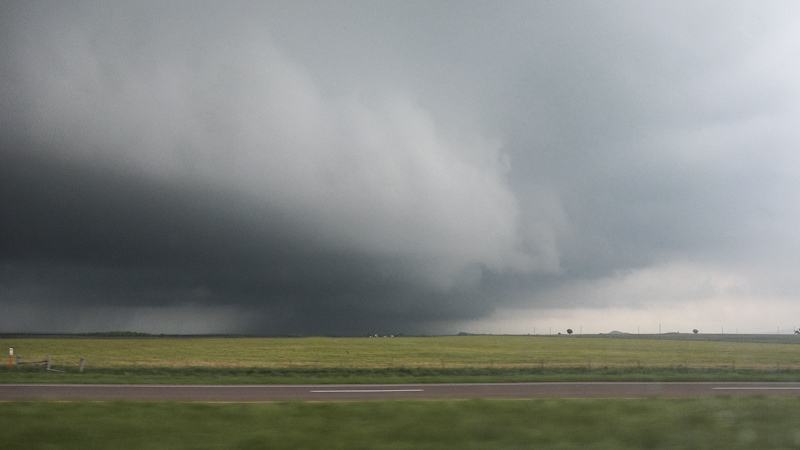 I tracked the storm to Lawton, getting ahead of it near Indiahoma. I didn't see much of an immediate tornado threat on it, and it looked like it was heading into cool, stable air so I left it. 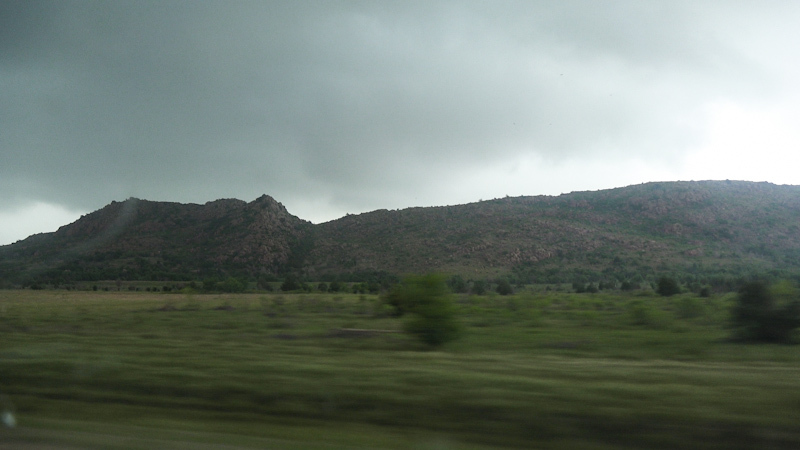 I went southeast after budding storms coming out off the north Texas dryline. They failed to organize so I called the chase and started making the long way toward home. The higher tornado probability day was again a disappointment on this trip, and I'd be leaving the Plains after nearly a week chasing without a tornado shot. A tornado was reported on my initial storm as it tracked up to Chickasha, but I didn't miss much as I can't recall seeing any memorable shots of it. The cap looks like it was the culprit in killing the southern end of the target area.